Okay, so it’s not really alfredo because it doesn’t even have any cream, but it’s close enough that I’m going to call it that. This fake-out alfredo is a little lighter and doesn’t hit your belly like a ton of bricks. That’s a little more my speed. This dish reminds me of the white vegetable lasagna that I used to love so much as a kid, except there’s no tedious layering going on. It definitely isn’t one of those quick one-dish meals that we all love so much, but sometimes a little extra time in the kitchen is totally worth it. I used four pots/dishes to make this pasta and I’m not the least bit sorry. 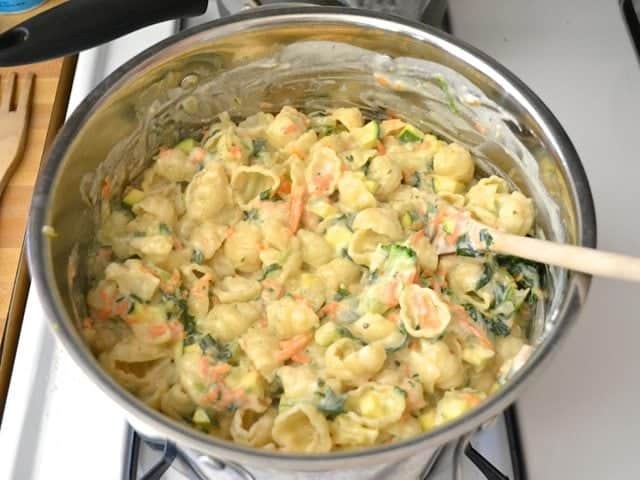 How can you be sorry when you have pasta slathered with a creamy sauce and a ton of delicious little vegetables pieces that give every bite a new flavor and texture? You can’t. You just can’t be sorry about dirtying dishes when you have something so great (and I don’t even have a dishwasher, y’all!). So, choose a day when you have some time and energy to make a masterpiece in the kitchen and make. this. pasta. Cooking can be therapeutic. Turn on some music and enjoy the process just as much as you do the end result. 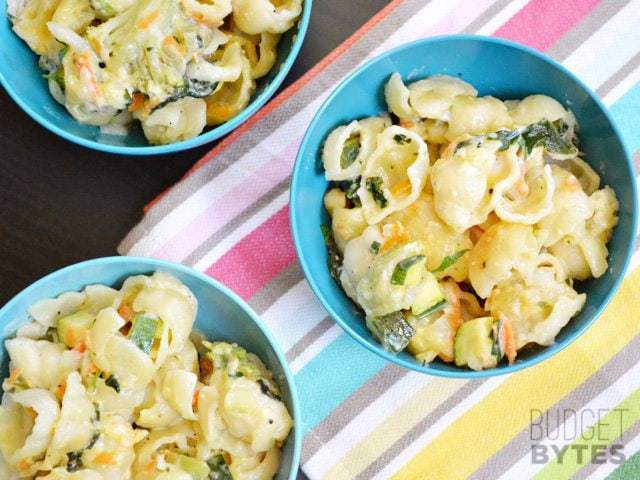 This super creamy yet light Vegetable Alfredo Pasta is loaded with enough vegetables to make your salad jealous. Begin by making the vegetable mix. Dice the onion and mince the garlic. Sauté both in a large skillet with the olive oil over medium heat until soft. 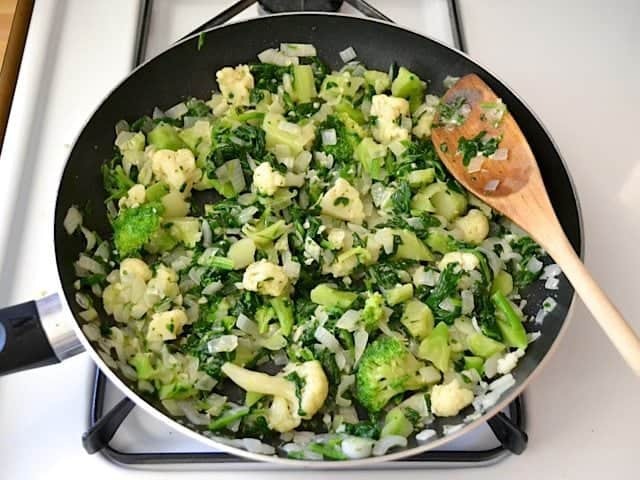 Add the frozen broccoli and cauliflower pieces and and the frozen spinach to the skillet. Continue to sauté until the frozen vegetables are warmed through. 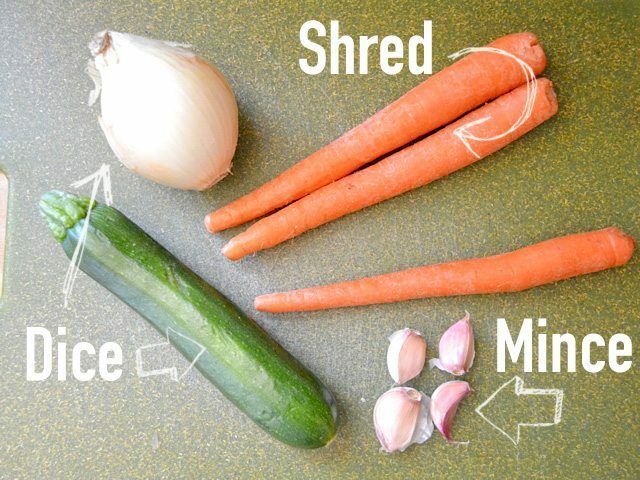 While the onions, garlic, frozen broccoli, and frozen spinach are cooking, peel and shred the carrots using a large hole cheese grater or box grater. Dice the zucchini into small pieces. Add the carrots and zucchini to the skillet and sauté for one to two minutes more. Season the skillet lightly with salt and pepper. Set the sautéed vegetables aside. Bring a large pot of water to a boil for the pasta. Cook the pasta according to the package directions (boil for 7-10 minutes, or until al dente). Drain the pasta in a colander. While the pasta is cooking, prepare the sauce. Add the butter and flour to a medium sauce pot. 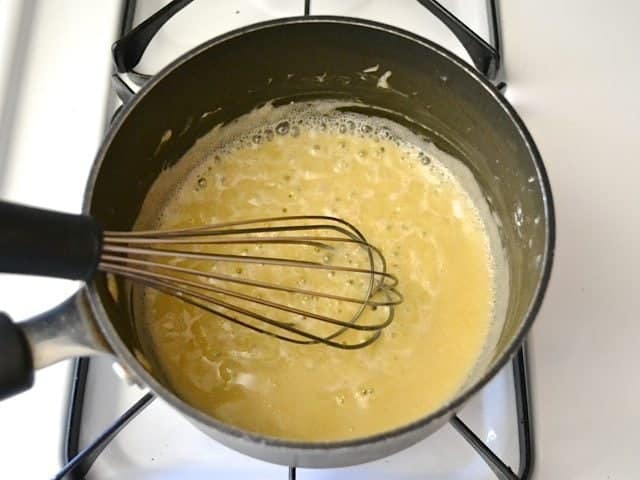 Melt the butter over medium heat and use a whisk to incorporate the flour as the butter melts. Allow the flour and butter mixture to begin to bubble. Continue to whisk and cook the mixture for two minutes. If it begins to brown, move on to the next step immediately. Whisk the milk into the butter and flour mixture. Also stir in the nutmeg, garlic powder, salt, and some freshly cracked pepper. Allow the milk to come up to a simmer over medium heat, making sure to whisk frequently to prevent scorching on the bottom. When the milk comes up to a simmer it will begin to thicken. 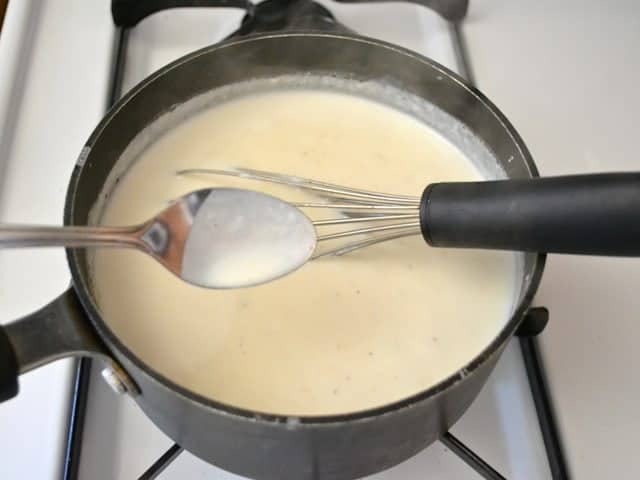 When the sauce is thick enough to coat a spoon, turn the heat down to low and whisk in the parmesan until it is melted and the sauce is thick. Turn the heat off. Preheat the oven to 375 degrees. Return the well drained pasta to the large pot with the heat turned off. Add the sautéed vegetables and the white sauce. Stir until everything is well combined and coated in the sauce. 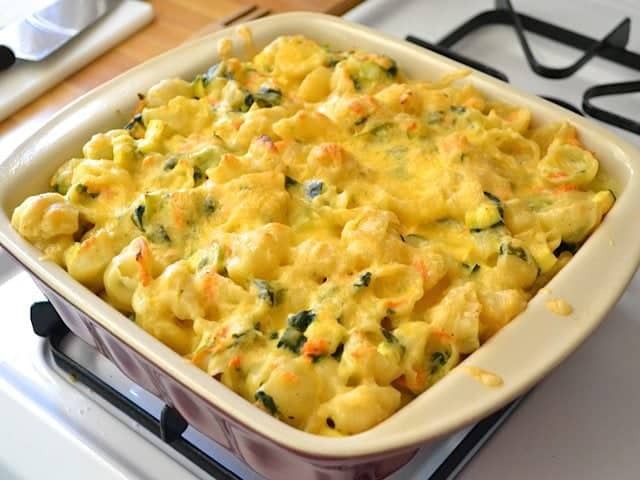 Pour the mixture into a casserole dish that has been coated with non-stick spray. 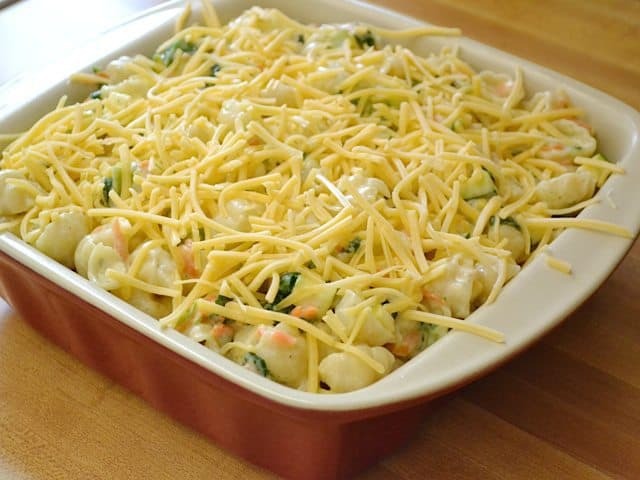 Sprinkle the shredded gouda on top and bake in a preheated 375 degree oven for 30 minutes. Serve hot. Start by preparing the vegetable mix. For fresh vegetables I used one small onion, four cloves of garlic, three carrots, and one zucchini. You’ll want to cut the onion and zucchini into a small dice, mince the garlic, and shred the carrots with a cheese shredder or box grater. I also used some frozen vegetables because I didn’t want to buy an entire head of cauliflower or a whole bunch of broccoli. Plus this way they’re already chopped. 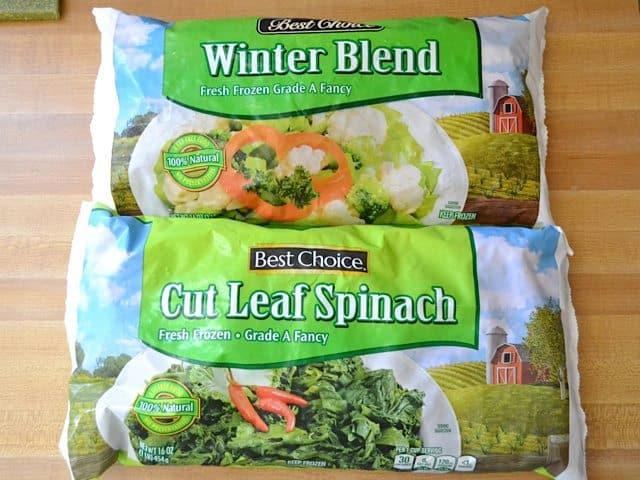 These are both one pound bags, but I used half of the bag of broccoli and cauliflower (“winter blend”) and 1/4 of the bag of spinach. So, that’s 1/2 lb. of broccoli/cauliflower pieces and 1/4 lb. of frozen chopped spinach. I began with the onion and garlic. Sauté them in a large skillet with 1 Tbsp olive oil until soft. Then add the 1/2 lb. of frozen broccoli/cauliflower and 1/4 lb. frozen spinach. Continue to sauté until those are warmed through (I did not thaw them first). Use the time while these are cooking to shred the carrots and dice the zucchini. 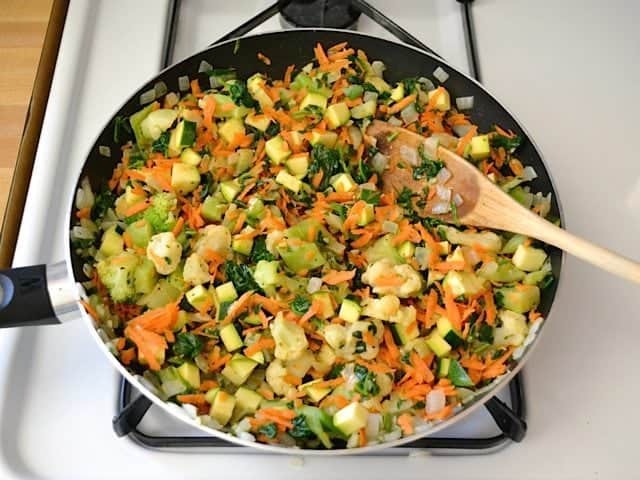 Add the zucchini and carrots to the skillet and sauté just a couple minutes more. I wanted the vegetables to be slightly crisp still because they will cook a little further in the oven later. Plus, I just like my vegetables to retain a little crunch. Season the skillet with a pinch of salt and pepper. Set the skillet aside while you make the pasta and sauce. Start the water for the pasta because that can cook while you’re making the sauce. To make the sauce, add 4 Tbsp of butter and 1/4 cup all-purpose flour to a medium sauce pot. Turn the heat onto medium and whisk the flour and butter together as the butter melts. Let the mixture begin to bubble, then whisk and cook for 2 minutes. This will slightly toast the flour to get rid of that gluey flavor. 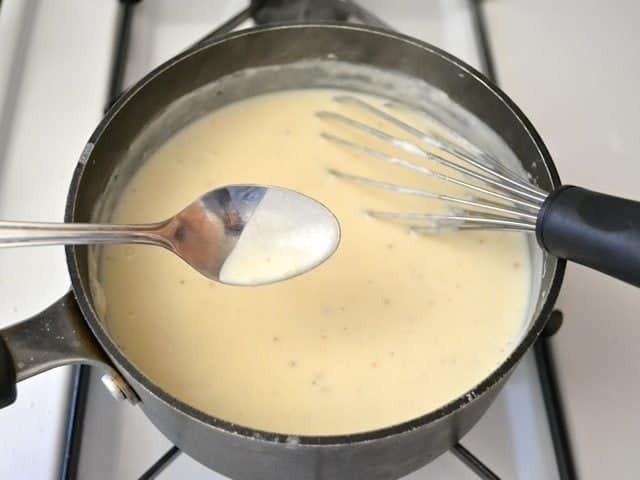 If the mixture begins to brown, move on to the next step immediately, or you’ll have a brown “white” sauce! Whisk four cups of milk (2% or higher milkfat). Then whisk in 1/4 tsp nutmeg, 1/4 tsp garlic powder, 1/2 tsp salt, and some freshly cracked pepper. 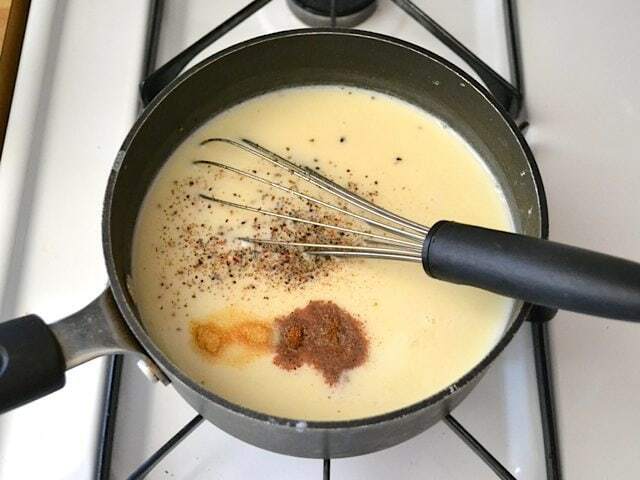 Let the milk come up to a simmer over medium heat, making sure to whisk frequently to keep the bottom from scorching. When the milk begins to bubble it will also begin to thicken – that’s when those starch granules in the flour plump up and make everything thick. It should get thick enough to coat a spoon like this (oops, I’m focused on the whisk and not the spoon! My bad.). Once you get here, turn the heat down to low. Whisk 2/3 cup grated parmesan into the hot sauce until it is melted. This will further thicken the sauce. It will now coat a spoon a bit thicker! Turn the heat off. By this time your pasta should be finished cooking. Make sure it drains really, really well. You don’t want a bunch of water trapped in the shells to make everything watery. 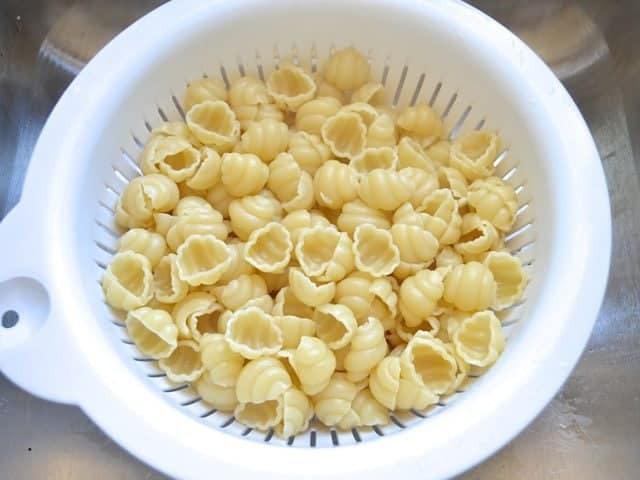 I used this cool shape, but you can use elbows, shells, rotini, or whatever you want. Oh, you’ll want to preheat the oven to 375 now, too. Return the drained pasta to the big pot that it cooked in (heat turned off) and add the prepared vegetables and the sauce. Stir everything really well or until everything is coated in the delicious sauce. Pour everything into a casserole dish (this one is about 9×9 inches and it was full up to the top). Sprinkle a cup of shredded gouda (smoked mozzarella would also be nice) on top. Bake in the preheated 375 degree oven for 30 minutes. Eat it up! 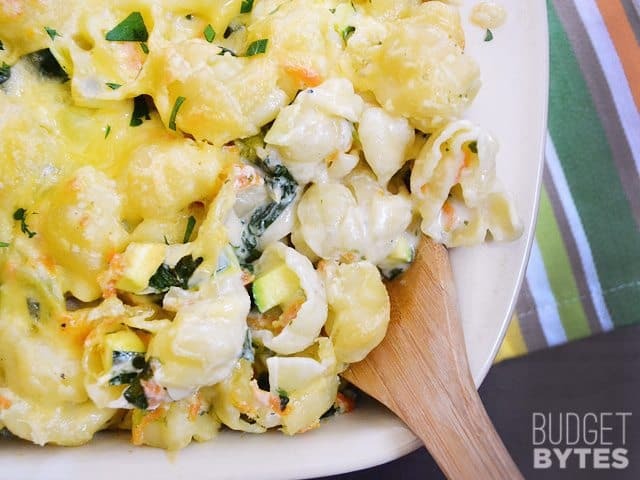 It’s so creamy and good with tons of vegetables. Yessss. Closer look at the creamy goodness? This was delicious. I managed to only use my dutch-oven, a strainer, and one large bowl! Cook the pasta first in my dutch oven, then drain and leave in the colander while chopping veggies. Then cook the veggies in the same pot and put back in the bowl. Then make the roux. Everything got mixed back into the same pot and popped straight into the oven with the cheese on top! Please excuse me if I missed it somewhere, but do you have nutritional info. for this recipe? It looks delicious. Thanks! No, I’m sorry, I don’t have nutritional info. Nomnomnom, that carrots in this dish are amazing! Loved this! Made one for me and one to bring to a family with a newborn. The only changes I made were to add frozen peas, shred the zucchini instead of dicing (I had my food processor out and shredding, anyway), and use smoked mozzarella. So good! Finally made this tonight and it is *really* good. I think I dirtied every pot in the kitchen but so worth it. Had always thought of broccoli and zucchini as somehow not belonging in the same dish, but the flavors all worked well together. You managed to get me over my fear of white sauce :) Thank you. (Sorry, I’m going through a binge on your recipes right now, haha.) Can this be stored in the fridge/freezer for a while before baking? Does it need to be baked at all? I’m wondering how it would taste just right off the stovetop. Yep, you can definitely just eat it off the stove top! That does make it a lot easier. I only did the oven step to melt the gouda over top and make it more casserole-like. Everything is already cooked before going in the oven, though, so it’s safe to eat. You can refrigerate or freeze it before baking, although I haven’t tested to see what time or temp would be needed to reheat. 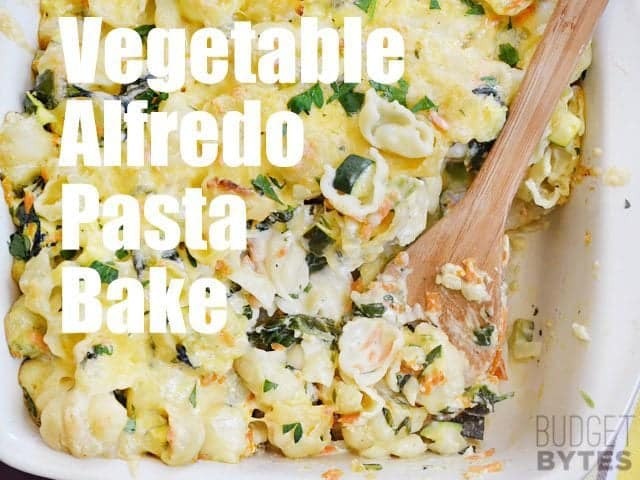 Is it alright to just use Alfredo sauce instead? OMG, this was SO good. Slightly involved but so worth it. The PERFECT way to use up the zucchini and carrot I had in the fridge and veggies in the freezer. Absolutely delicious and makes a TON. I’ve been heating this up and eating it for lunch for the last week and it is STILL good. Still creamy and tasty and the little bit of smoked cheese on top, delish! I cannot believe how good this is left over a week later. 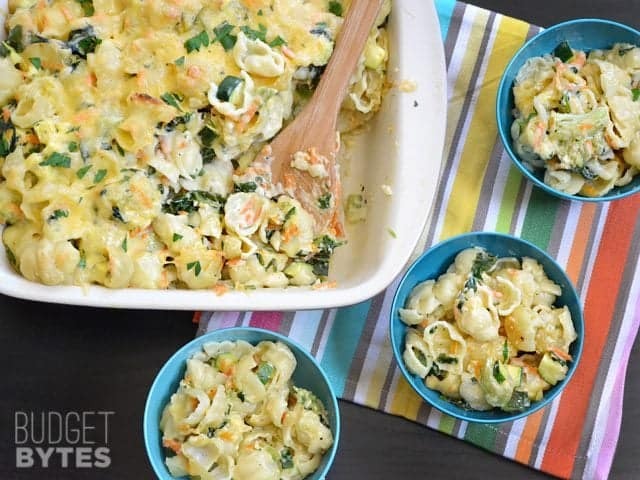 Great way to use up veggies in the fridge! Yum!